Leicester City have been lethargic all season but the Foxes looked shamefully energised by the sacking of Claudio Ranieri as they tore Liverpool apart on Monday night. Jamie Vardy led from the front and scored twice, either side of a rare Danny Drinkwater worldie, before Philippe Coutinho netted a consolation goal for Jurgen Klopp’s awful Reds. 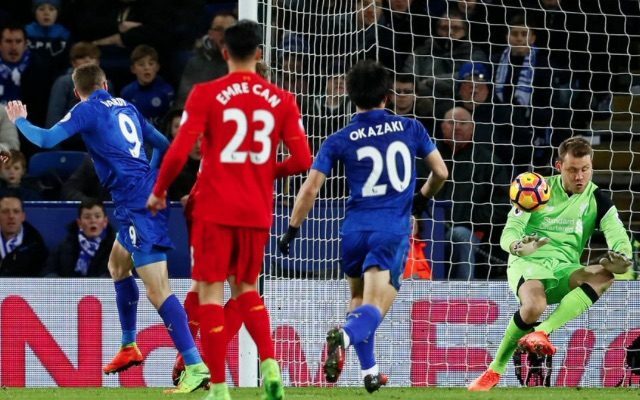 To a man, Leicester were excellent, while – other than Coutinho and Emre Can who did OK- all of Liverpool’s outfield players disappointed terribly. Tactically, Liverpool got it wrong. Klopp’s decision to play a high defensive line was punished as Vardy used his pace to run in behind Lucas Leiva and Joel Matip all game. Matip was particularly poor, also looking weak in the air despite his 6′ 5″ height. Lucas was similarly awful aerially, but that is to be expected. Roberto Firmino’s touch was unusually heavy, while Sadio Mane failed to make an impact before being hooked on 65 minutes. Coutinho looked bright, firing in six shots, including four on target, but the Brazilian shone alone. Can was probably Liverpool’s second-best performer. He set up Coutinho’s goal and won six tackles as he battled in vain in the centre of the park. Kasper Schmeichel 7, Danny Simpson 6, Robert Huth 6, Wes Morgan 6, Christian Fuchs 8, Riyad Mahrez 6, Wilfred Ndidi 8, Daniel Drinkwater 8, Marc Albrighton 8, Shinji Okazaki 6, Jamie Vardy 9. Subs: Daniel Amartey (68′ for Okazaki) 6, Demarai Gray (79′ for Mahrez) 5, Ben Chilwell (90′ for Albrighton) n/a. Simon Mignolet 6, Nathaniel Clyne 5, Lucas Leiva 4, Joel Matip 4, James Milner 5, Emre Can 7, Georginio Wijnaldum 5, Adam Lallana 5, Sadio Mane 5, Roberto Firmino 5, Philippe Coutinho 7. Subs: Divock Origi (65′ for Lallana) 5, Alberto Moreno (65′ for Mane) 5, Ben Woodburn (83′ for Lucas) n/a.